Which of us know that the State animal of Maharashtra is SHEKROO – The Giant Squirrel found in the tall canopy of the Bhimashankar forest and along the Malabar region. How many of us know that every state of India has a state animal. This lack of exposure is one of the motivation to write modern, masaledar books about Indian wildlife for children and young adults of our country who know more about the panda and the kangaroo, than about the animals that roam Indian jungles and labour in our towns and villages. Preservation of our environment has been part of Indian culture and heritage from time before history. It was interwoven into the lifestyle of the time by advocating vegetarianism and non-violence. Conservation was also worked into the dominant religions and mythology, with animals being given pride of place beside gods and goddesses as their primary mode of transport. Animals which were not 'vahanas' of the gods were also linked to some aspect of nature and given special status. So Saraswati, the goddess of learning has a swan and a peacock permanently seated beside her, to demonstrate true learning versus knowledge as ego. The blackbuck, an antelope which is the state animal of Andhra Pradesh, is also known as the vehicle of the moon god Chandrama. The animal is said to bring prosperity to whichever land it chooses to dwell in. These holy connections make it harder to shoot wildlife for their feathers and antlers or to hunt them for sport. Domesticated animals also had stories worked into old village folklore and were transferred from generation to generation. Even the simple Indian donkey has a story about how the species helped mankind to find water and survive a drought on earth, which was sent by the gods. The angry deities punished the donkey to be an eternal beast of burden. This story makes it a little more difficult to beat or mistreat a donkey that may be pulling a cart or struggling with a heavy load. But these stories have been lost along the way with urbanisation and the speed of modern life. And many of these stories, which survived, like the Jataka Tales and Panchatantra, are important, but slightly archaic and now only connect to really young children. Older children and young adults are the future of the nation, hold in their hands any hope of the survival of the Bengal Tiger or the Indian Gharial. 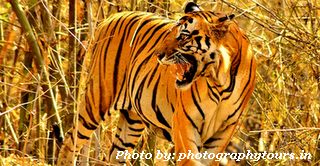 These wild animals have to be made familiar, popular and appealing to them so that they can develop sympathy, sense of pride and ownership of the wildlife, which is so unique to the Indian subcontinent. Before it is too late. That is why I write. And I focus on contemporary stories about Indian animals for the young. It’s a glaring gap in our consciousness that has to be bridged by films, comics, storybooks. Popular media that is easily acessible to the youth of this nation – told in a style that they can connect to. That is the driving force of WilderIndia. Mythology and wildlife are combined in these stories for young children in modern stories set in todays India. In these stories young children have a adventures with ethinic Indian animals and discover how special every living creature can be. The stories are set in three different parts of India and are illustrated by collage art. Every state has a state animal. These three stories cover three states of India. Moru has to leant to dance to become a real Oriya peacock prince. The blackbuck of Andhra has to outrun the cheetah to survive. Shekroo the Maharashtran squirrel is too pround of her tail. Each of these animals have a special challenge they have to face. Illustrations of the book are created from the traditional art of the state. At the end of each story is a short writeup about the animal in its natural habitat. As your own Indiaplaza customer care claims that no such person exists in their company. I would like to know when the refund will be reflected in my GC FAB13592735130050 ? You have already closed the Ticket CNT1012110027??? So from your side you feel all is well. All of you sitting in Indiaplaza office are Spineless people as none of the seniors is ready to answer my call. They are running helter skelter the moment i call up. As this is one Frustrated customer waiting for a resolution since 10th December. Lets see after this email / post if you have the guts to call and resolve this matter. You have used the image of tigers without our authorization. The image is under copyright act and was clicked by our photography chitransh saxena for photographytours.in. Therefore we request you to either delete the image or give us the credit.